Another great adventure for Gemma and the 'Old Biddies.' This is one of the better books in the series. 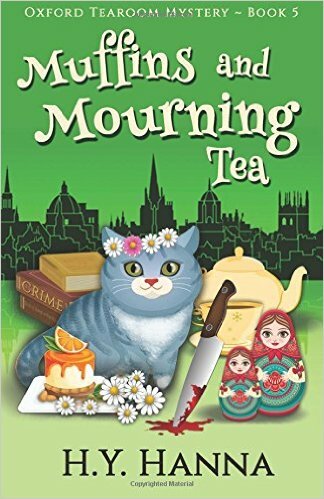 What I love most about The Tearoom Mysteries is that they are so funny. I love the humour; in this installment the Old Biddies doing Krav Maga provided plenty of light relief. Muesli also has his fair share of excitement and I couldn't help but laugh at his antics at the nursing home. On a romantic note Gemma is worried about her relationship with Devlin as he works non stop and acts strangely around her. This story line kept the romance interesting for me. Lincoln, one of my favourite side characters, makes an appearance in this episode as well. The mystery was fun but complex and it had me eagerly following the clues along with Gemma who seemed to be doing a better job of investigating than the police. I love this series and I highly recommend it to all fans of cosy mysteries. Hi Penney. Thanks for the follow and for stopping by my blog today. Have you read the first book in the series A Scone to Die For?